Accompaniments like raitas, chutneys and achar add more punch to any meal, transforming even simple dishes into a memorable meal. Even on days when you do not feel hungry at all, these refreshing and flavour-packed accompaniments prod you to eat some – and then some more! Raita can be made by adding vegetables, fruits, multiple or combination of both in the curd. It can be perked up with an addition of spices or refreshing ingredients like mint and coriander. Fresh fruit raita is not only tasty and crunchy but also, a powerhouse of calcium. If you don’t like many fruits, you can make Mango Raita or Pineapple raita. This Mixed Veggie Raita is filled with colour, flavour and nutritional goodness. Add more zest to snacks and meals with accompaniments like Palak Raita. A tongue-tickling concomitant for hot parathas is Carrot Pickle made by just combining carrots with few seeds and spices. Nothing beats a spoonful of peppy pickle to enhance the flavor of bland meals. Lehsun ka Achaar and Nimboo ka Achar has fans spanning across generations! Apart from the regular Green Chutney, khajur imli ki chutney, Anardane Te Phudine ki Chutney is a unique chutney made by combining coriander and mint with pomegranate seeds. 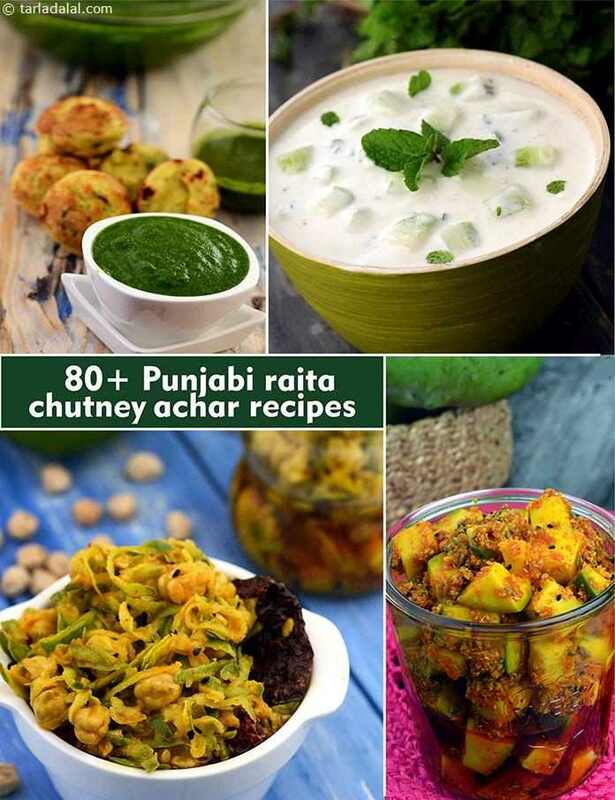 Enjoy our Punjabi Raita Recipes, Punjabi Chutney Recipes, Punjabi Achar Recipes.